(Nanowerk News) Despite the difficult economic climate, many researchers from ETH Zurich founded a company last year. The university recorded no fewer than 24 new spin-offs in 2009 – the most ever in a single year. Four of them are involved in the “cleantech” industry and deal in environmentally friendly technology. Researchers from ETH Zurich also founded one spin-off each in advanced materials, biotechnology and pharmaceuticals, micro- and nanotechnology, and medical devices. The new spin-offs’ range of products include flying robots, injections on the nanometer scale and a method for measuring the melting properties of ice cream. It is striking that four out of 24 spin-offs were established in the “cleantech” sector. “Cleantech” is the abbreviation for “clean technology” and stands for any products, processes and services that go easy on natural resources and reduce the negative impact on the environment. The four cleantech companies come from different technical areas: “Amphiro”, for example, develops energy and water-saving software and the spin-off “Keoto” renders engineering services for sustainable building. The founders of “greenTEG” sell flexible and inexpensive thermoelectric equipment that converts waste heat into electricity. The business concept of “ClimeWorks” is based on innovative technology that collects CO2 from the air, stores and delivers it to somewhere where it can be put to good use. Independent committees also have high hopes for ETH Zurich’s spin-offs. Numerous company founders have received major advancement awards, such as the ZKB Pioneer Prize or the W.A. de Vigier Foundation Prize. 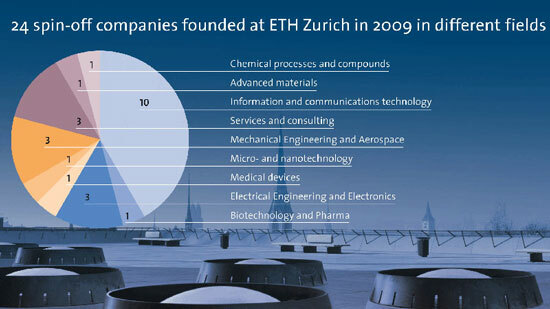 In all, ETH-Zurich spin-offs received over 1.5 million Swiss francs’ worth of national prize money last year – half a million more than in 2008. ETH transfer offers advice and support to the ETH-Zurich researchers in the initial stages of setting up a company. Experienced technology transfer managers help the scientists to draw up a business plan or find suitable premises at the Technopark or ETH Zurich. Moreover, they also put the company founders in contact with external investors and consultants. Over the last few years, ETH transfer has built up a large network of decision makers and investors. Every two years, ETH Zurich co-organizes the largest business plan competition in Switzerland with McKinsey and now also the Swiss Confederation Innovation Promotion Agency (CTI). “Venture” was founded in 1998 and is funded by Swiss industry. The application process for Venture 2010 got underway in October 2009. The best business ideas will be selected on January 14 in the presence of the President of the Swiss Federal Council Doris Leuthard. The competition will then enter into its second phase: the development of the business plans, the best of which will be chosen in May 2010.